The River Shannon is named after Sinann – celtic goddess, slayer of sea monsters. The many variations of her story highlight the importance of Ireland’s largest river as a vital resource and an integral part of our landscape and culture. Harnessing the River’s power through hydro-electric stations transformed the economic and social life of the country. Ecological disruptions resulting from river engineering reveal, however, a disturbance that parallels the development of modern Ireland. Against the Current is a poetic indictment of what we might call progress. Following a research residency in Limerick, Mark Dion presents a new body of work about the depletion of wild species in Ireland’s rivers. Cut into several sections, the eponymous sculpture of a severed eel indexes the cuttings of the River Shannon by modern engineering. The large-scale sculpture, The Salmon of Knowledge Returns, hovers above a topography of curiosities and treasures, debris and detritus. The salmon is both the custodian and surveyor of those things we have cast into the flow of the river and cast off in the rush of progress. Both the depleting salmon population and the need for an eel management system are direct results of the blocking of pathways by which wildlife migrates and along which the water, sediments and nutrients required for their survival travel. An optimism is expressed through Dion’s sculptures and drawings. Mythologically, the salmon is the embodiment of the wisdom of the arts. Its persistence in swimming against the current points towards the role of the arts as a counterpoint – challenging ineffectual environmentalism and questioning progress. Like the mortal Sinann who saw the potential of the magical waters, perhaps via Dion’s works, we can again draw wisdom from our rivers with a mindfulness of our impact on the many lives – animal and human – woven together in their currents. Mark Dion is a conceptual artist interested in natural history, field work, and biology. Since the early 1990s, he has developed a dynamic and remarkably influential art practice which includes sculpture, installation, photography, and print-making, along with writing, teaching and institutional collaboration. His work can be found in the collections of the Metropolitan Museum of Art, New York, Tate Gallery, London, The Museum of Contemporary Art, Los Angeles, Museum of Modern Art in New York, Centre Georges Pompidou in Paris, Hamburger Kunsthalle in Germany, Harvard University Art Museums in Massachusetts, and the Israel Museum of Art in Jerusalem, among others. The artist and curators would like to thank Dana Sherwood, Raina Belleau, Sheila Deegan, Dr. Dominique Bouchard, Sophie Byrne, Janice Hough, Vanessa Daws, Steve Doodey, Vanessa Donoso Lopez, Hannah Fitz, Sharon Ramsey, Kate Harrold, Ray O’Halloran, Mick Slattery, John Carew, Tom Lewis, Liam Forde, Parallel Editions, the team at canteen, Fire Station Artists’ Studios, the team at Ormston House and Nelly. The exhibition is kindly supported by the Arts Council of Ireland Visual Arts Project Award and a production residency at the Irish Museum of Modern Art. 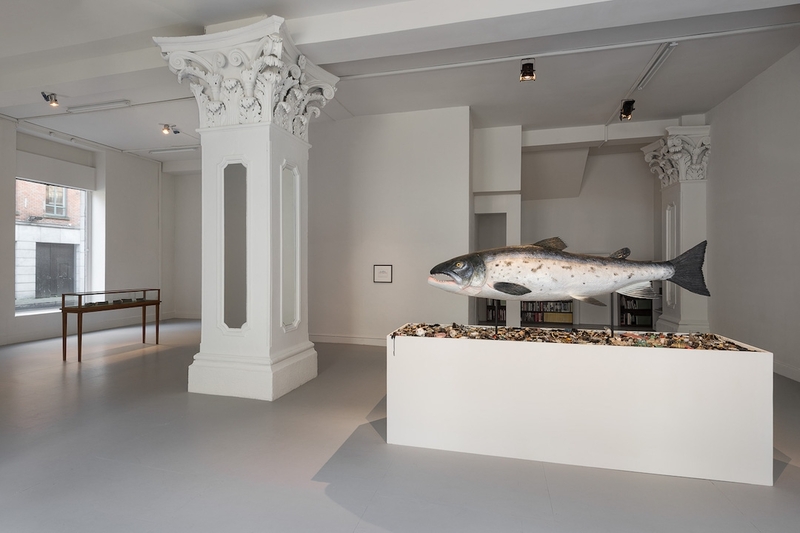 Against the Current is a solo exhibition by Mark Dion co-curated by Mary Conlon (Ormston House) and Ian Russell (David Winton Bell Gallery, Brown University). The Salmon of Knowledge Returns (2015), a limited edition print co-produced with Parallel Editions is available to purchase at Ormston House/info@ormstonhouse.com. Image: installation view of Against The Current. Photograph by Jed Niezgoda.